Palestinians Ponder Tactics in Weeks-Long Gaza Protest: What's The End-Game? : Parallels Hamas encouraged Palestinians to protest. 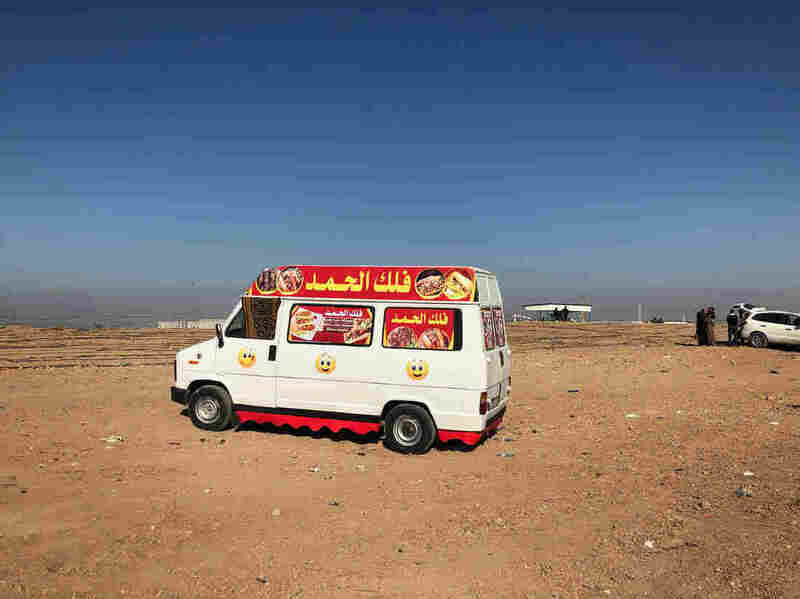 Some believe it wants to distract Gazans from hardships like unemployment and power cuts. But many are protesting precisely because of these frustrations. Palestinians stand on a mound at the site of a tent protest in support of Palestinian refugees returning to lands they fled or were expelled from during the 1948 war surrounding Israel's creation, near the border with Israel, in the southern Gaza Strip on Wednesday. "It's like moving the horse in chess," said Jaber Abu al-Amrein, 24, the well-dressed chess enthusiast. "It's a special kind of maneuver." 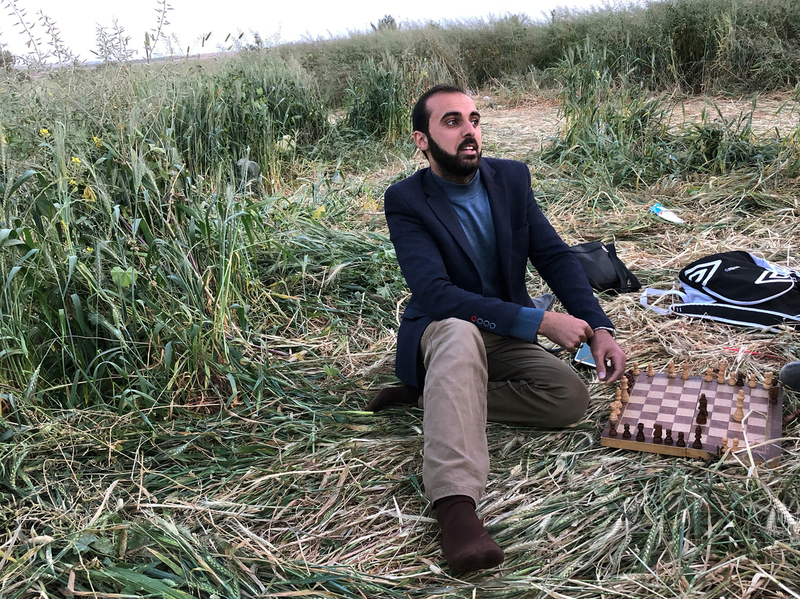 Jaber Abu al-Amrein, 24, sits in a barley field near the Gaza border and plays chess with a friend. Palestinians are gearing up for another Friday of large and potentially bloody demonstrations. Palestinians are holding a six-week protest billed as the Great March of Return, a daily gathering at the Israeli border, demanding that Palestinians be allowed to return to lands they fled from or were forced out of in the 1948 war that led to Israel's founding. Palestinians say they are holding a peaceful protest. Israel says the militant group Hamas, the de facto ruler in Gaza, has been a driving force behind the protest to distract Palestinians from hardships in Gaza that the group has struggled to address. It says Hamas is trying to turn the border zone into a battlefield under the pretext of a citizens' protest, and it warns it will not let Palestinians even approach the immediate area next to the border fence. 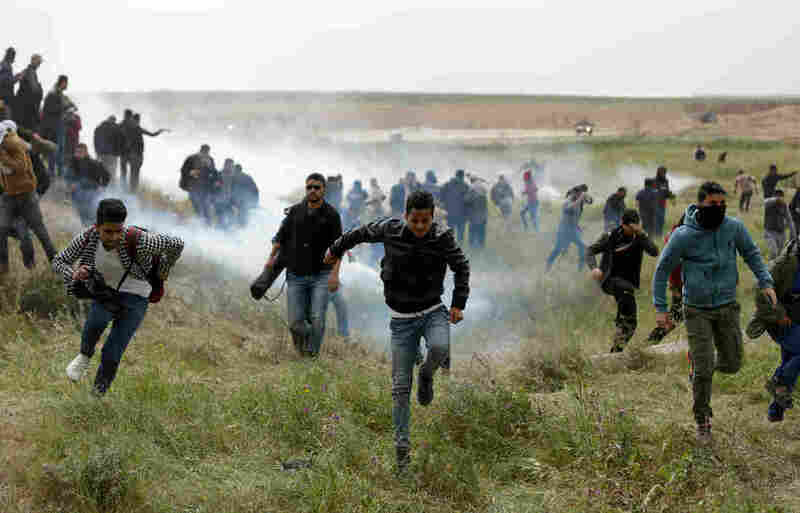 On the first day of the protest, last Friday, about 30,000 Palestinians gathered along the border and some threw rocks and firebombs at troops, according to the military. Nineteen Palestinians were killed and 1,492 wounded in confrontations with Israeli troops since Friday, according to Palestinian health officials. Israel argued fewer had been wounded, and said two who opened fire toward troops and Hamas militants who tried to damage the border fence were among those killed. Palestinian protesters flee from tear gas during clashes near the border with Israel east of Gaza City during a demonstration on March 30. It was the largest protest and bloodiest violence Gaza has seen in years — and, according to the Palestinian chess players, an effective strategy to highlight Israel's heavy-handed response. United Nations and European Union leaders called for an independent investigation and human rights groups accused Israel of excessive use of force, which Israel dismissed. "Their king is already in the corner," said another chess player, Abdel Gader Sabara, 22, borrowing from a chess metaphor. "This kind of peaceful protest showed how ugly they are." Large crowds are expected to gather again at the border Friday, and some protesters have stockpiled tires to burn — aiming to block soldiers' view with thick pillars of black smoke — and called on people to bring mirrors to reflect the sun's rays in soldiers' eyes. Brig. Gen. Ronen Manelis, spokesman of the Israeli army, told foreign press in a telephone briefing that Palestinians gathering farther away from the border near tents would not be in danger, but "Hamas knows very well" which area on the Gaza side of the border fence Israel considers a military zone, and that those who enter that area were endangering themselves. A food truck is parked several hundred yards back from the border fence. In a Facebook post, the spokesman of the protest, Ahmed Abu Ertima, objected to the tire and mirror plans, urging a peaceful sit-in. Several hundred yards back from the border fence, the area has the vibe of a county fair. Food trucks sell fresh juice. A woman served from what was billed as the world's biggest pot of sumakiyyeh, a Gazan sumac-infused stew. A preacher led a young men's Quran recitation session. Men attempted to release a cage of pigeons as a symbol of peace, and families picnicked with their young children. 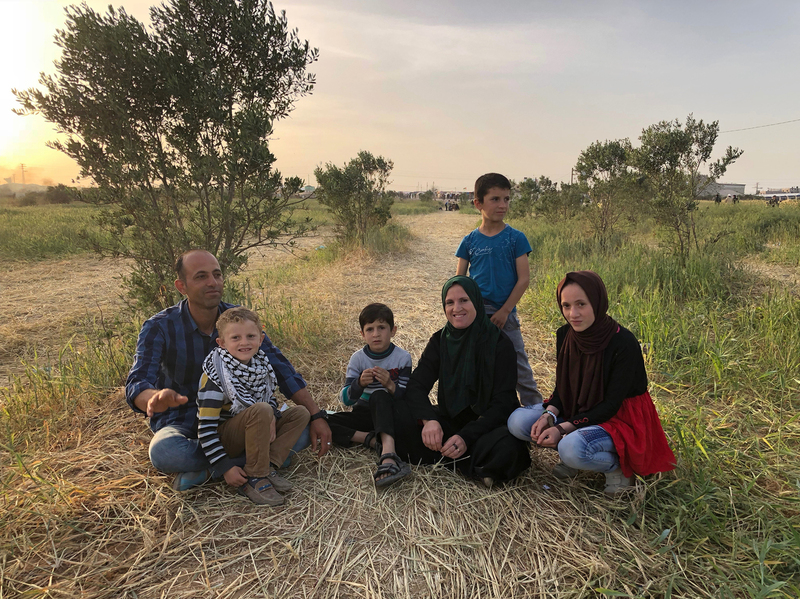 A Palestinian family sits in a field close to the border. The border protest reflects Hamas' current circumstances. After the group wrested control of Gaza nearly 11 years ago, Israel and Egypt imposed a blockade on the small seaside territory. Hamas has carried out attacks on Israelis and three wars with Israel, and Israel considers the group a terror organization (as does the U.S.) and Gaza a hostile entity. But recently, Hamas has been facing pressure. Palestinian Authority President Mahmoud Abbas has imposed sanctions on Gaza in efforts to pressure Hamas to give back the keys to the territory. Egyptian-mediated efforts to reach a political compromise are faltering. 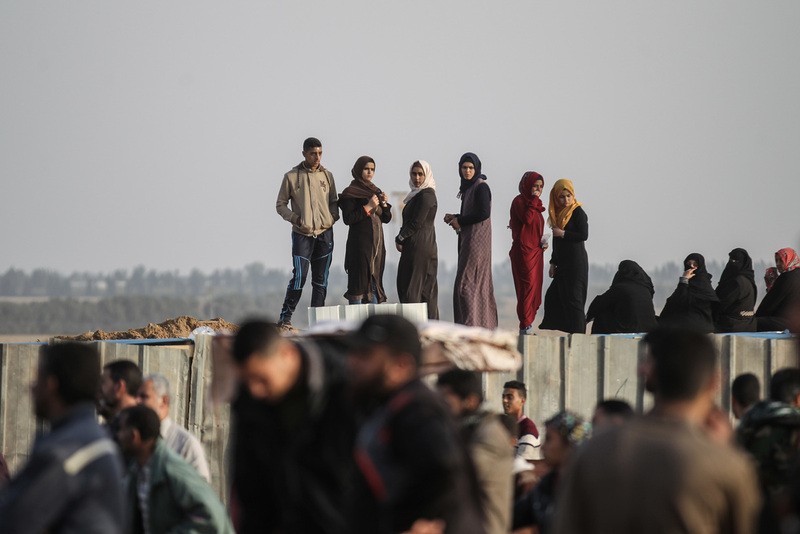 Omar Shaban, an economist and political analyst in Gaza, said Hamas is looking to shore up its position with the border protest. Palestinians take part in a Quran recitation session in an area several hundred yards back from the border fence. "They want to prove that they are still in control," said Shaban. "They still have the ability to mobilize people." 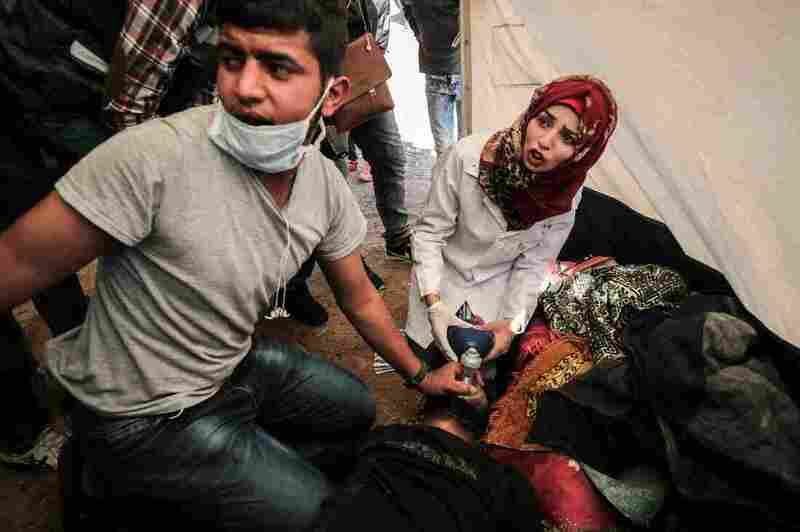 Hamas encouraged Palestinians to join the protest and handed out $200 vouchers to those who were wounded near or at the border – a significant sum in the Palestinian territory, where unemployment is at 45 percent. "Loyalty to those who are loyal," reads a slogan in Arabic on the vouchers, to be cashed at local banks. Shaban said Hamas also seeks to distract Gazans from dwelling on the hardships of life in Gaza, like unemployment and shortages of electricity and potable water. Sameh Sarsak, 33, holds his daughter. He is a trained nurse and is unemployed. But many Palestinians were motivated to go to the border because of those very frustrations. "People are despaired from their life," said Sameh Sarsak, a 33-year-old father who is a trained nurse and is unemployed. "They have nothing in their pocket. They have no money. They have no work ... they come here to express about their angers, nothing more." 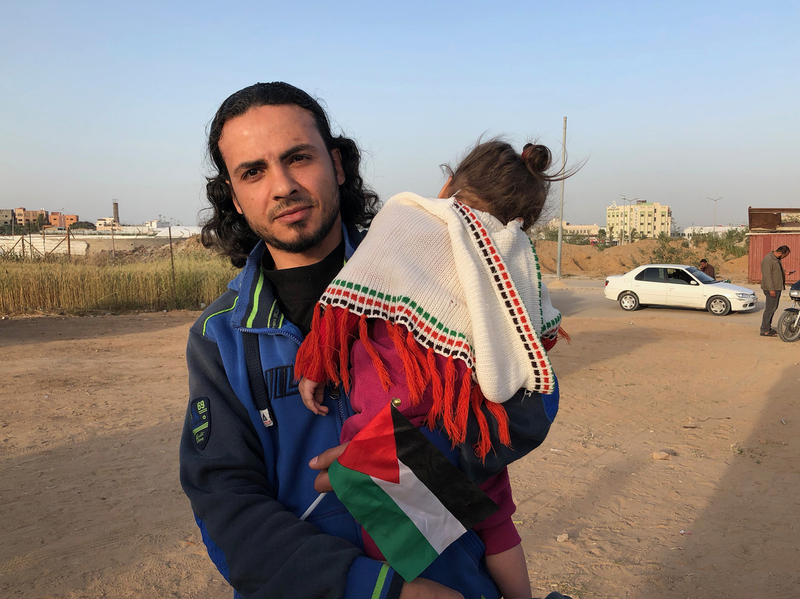 Sarsak said he came to the border to show solidarity with Palestinian refugees seeking to return to their lands in today's Israel. But the young Palestinians protesting at the border "will achieve nothing," he believes. "They are going to the borders by their bare chest to challenge the soldiers with weapons and snipers," Sarsak said in English, his nearly 2-year-old daughter asleep in his arms. "[The soldiers] are stronger more than us. OK, we have the power in our heart." But, he said, power in one's heart cannot defeat an army.